Saint Drosida is one of the very many Roman noble virgins who didn’t enjoy their title and social position and chose the love of Jesus Christ until their death. Without being so tormented as her sisters in Christ Santa Lucia, Saint Catherine, Caecilia and many other, because she was the daughter of the Emperor Trajan (98-117), she still choose to die as a martyr for her Lord. Emperor Trajan was one of the emperors whose origins were not exactly noble; at least he didn’t come from Rome. Born in Spain, he served as a soldier and then general in the army from Hispania Tarraconensis. There is to be mentioned that his Father was between 76/77 the Governor of Syria, and that’s why Drosida, Trajan’s daughter lived and died as martyr in Antioch. In 89 Trajan supported the emperor Domitian against a revolt on the Rhine. Later, in 96, Domitian was succeeded as emperor by Marcus Cocceius Nerva, an old and childless senator, quite unpopular with the army. After pressures came from the Praetorian Guard, Nerva adopted Trajan as his heir and successor. Nerva died on 27 January 98, and was succeeded by Trajan, who reigned for about 19 years. During his years as Emperor, the Roman Empire set the maximal borders, by conquering Dacia (106), Nabataea (107) and Mesopotamia (114). In the meantime, Trajan was one of the persecutors against the Christians. In the year 99 he re-activated an earlier existing law which forbade secret gatherings and was indirectly aimed against Christians, and in the year 104 he issued a special law against Christians. The application of these laws was not so strictly observed. Between 109 and 111 AD, Pliny the Younger, sent in Bithynia as governor, reports to Trajan about the Christians in his region. The governor indicated that he had ordered the execution of several Christians, "for I held no question that whatever it was they admitted, in any case obstinacy and unbending perversity deserve to be punished." (Letters 10,96). He was unsure what to do about those who said they were no longer Christians, and asked Trajan, who decided that Christians should not be sought out, anonymous tips should be rejected as “unworthy of our times”. But those who being discover, still persisted to testify their faith for Christ should be punished. Some regional persecutions still happened. So is with Saint Ignatius, bishop of Antioch, also known as “The God-Bearer” or the “Theophore”, who was sent to Rome died in the Roman Circus, during the festivities happened after the victory against Dacia (107). Trajan had a daughter with a Greek name, Drosida (meaning “dew”), who lived as mentioned, in Antioch. More about her there’s not known. Holy Martyress Drosida was friend with five canonical virgins who lived in a house, keeping the Commandments of God. At their moment the monasticism still wasn’t institutionalized, but already practiced in some houses from Rome, Antioch or other cities, still not yet in the deserts of Egypt or Asia Minor. 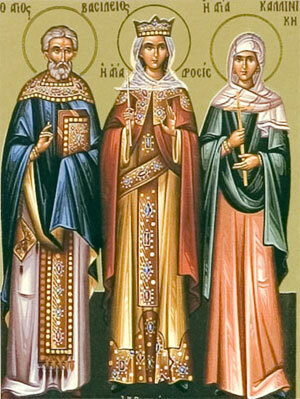 The “nuns” were called Aglaida, Apollinaria, Daria, Mamthusa and Taisia and their mission was to pick up the relics of the martyrized saints, anointing them with oil and putting in special coffins destined to the relics. Drosida came sometimes secretly to the maiden house in the night and helped them sometimes with money or other stuff they needed, in order to be able to take the bodies of the saints. At that time, Hadrian, Drosida’s fiancé (maybe the next emperor Hadrian?) was adviser to the governor, and he asked to put soldiers as guarders for the dead bodies of Christians, in order to know who those who raise their bodies are. In this way, the guards seized five women, and with them was also Drosida. Drosida was locked into her house, but the other five virgins were killed and burnt, and their ashes were spread into the melted bronze used to build a public bath. At the day of celebration lots of people ran to the bath, but many of them died at the doors, apparently because of the crowd. Anyway, the emperor, being there, believed that this happened because of a spell made by the Christians, but the builders told him that the copper vessels of the bath contained the women's burnt bodies. Then the emperor commanded the melting of those vessels, in order to make from then idols with the faces of the five virgins and to put them in the bathroom, for their dishonesty. After the commands were accomplished, the emperor had a dream about five lambs that were grazing in a clean garden and an awesome shepherd, who told him that the five lambs are the virgins who are now in Paradise, and also told that the emperor’s daughter, Drosida, is waited there to come. The emperor woke up and was very angry. He ordered to build and ignite a big furnace of fire in the main square and put a note, telling to the Christians to escape themselves from the further persecution by throwing themselves in the fire. 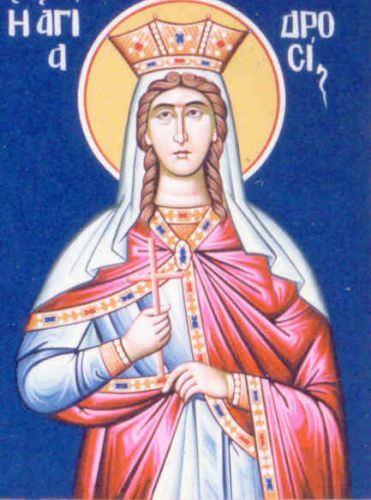 Drosida, still locked in the house, prayed to God in order to escape and to join her friends in martyrium. In the night she disguised herself and managed to escape. But on the way to the furnace, she asked herself, how she could go to the Lord without the wedding dress, because she was still not baptized. Then she prayed to Jesus Christ and said: “O King of kings Lord Jesus Christ, on account of you I forsake my imperial position, so that you might vouchsafe me to be the very least door-maid in your kingdom. Please baptize me with your Holy Spirit”. With this word, she anointed herself with the myrrh she had taken along with her, and submerged herself in a river for three times, saying: “the servant of God Drosida is baptized in the Name of the Father, and of the Son, and of the Holy Spirit”. In the next seven days she hid herself, fasted and prayed. And on the eighth day the holy Drosida went to the Lord. The Russian Synaxarion explains that she cast herself into the fire of the red-hot ovens, though that is unclear. That happened on March 22, 104 AD. I found very interesting to note also what happened with emperor Trajan. Early in 117, being in Cillicia he grew ill and set out to sail back to Italy. His health declined throughout the spring and summer of 117 and died from edema on August 9 in Selinus, a town in Cilicia which was afterwards called Trajanopolis. His successor was Hadrian, who apparently was adopted by Trajan sometimes before. The Romanian Prologues, copied after the Prologues of Ochrid tell some interesting informations about the destiny of the emperor even after his death. St. John from Damascus noted in his Word for the ones fallen asleep that: "Gregory the Dialogos, bishop of the old Rome (590-604), as all know, was famous by his holiness and wisdom. When serving he had with him as a fellow-minister an angel from heaven. Once, traveling on the stone bridge and standing more time there purposely, made a prayer to the Lord for the forgiveness of the sins of Emperor Trajan. Then, he heard the voice of God, saying: "I heard your prayer and I gave forgiveness of Trajan, and you shall not do prayers for pagans anymore". This history is also mentioned in an English vita of Gregory Magnus from the 8th century: “One day, while passing through the Forum, to the Saint have been revealed a great deed who is said that he did Trajan, and looking at it carefully, reasoned that although Trajan was a pagan, had an act as good, that it seemed rather to be the act of a Christian than a pagan. For there is said that when being with his army in pursuit of the enemy, he was full of pity at the words of a widow and he stopped the army to listen to her. She said: “Lord Trajan, behold the men who killed my son and they do not want to give me pay for it.” He replied: “Tell me about it when I get back and I will compel them to make your payment”. But she said:”Lord, if you not ever come back, there will be nobody to help me”. 'Then, as he was armed, he forced the guilty to pay immediately what they supposed to do in front of him. When Gregory discovered this story, he realized that this was just what we read in the scripture: “take care of the parentless children and support widows. Come to ponder together, said the Lord”. Because Gregory did not know what to do to ease the soul of this man who remembered the words of Christ, went to the Church of St. Peter and shed seas of tears, as his custom, until, finally, the revelation learned that his prayers were answered, because he never asked that to any other pagan “ (The First Life of Gregory The Great, written by an unknown monk from Whitby, transl. Bertram Colgrave, The University of Kansas Press, Lawrence, Kansas, 1968, pp. 127-129). Saint Alexius “The Man of God”, also known as “Alexius from Rome” or “Alexius of Edessa” is one of the mysterious saints of the Church. He can be put together with some other saints, called “fools for Christ’s sake”, being one of the first saints having a controversial life, maybe even scandalous not only for a contemporary reader, but also in his century. The classic vita of this saint is to be found in Legenda Aurea of Jacob de Voragine, Bishop of Genova, and according to it, he may lived in Rome and Edessa and later back in Rome, in his father’s house, during the reign of the western Emperor Honorius (395-423) son of Theodosius the Great and during the prelacy of the Saint Pope Innocent I (401-417). First I will make a résumé of his life, as it is read today in the Orthodox Synaxarion of the Saints (almost the same story like in the Legenda Aurea), being the most complete text, and after that I will analyze the authenticity of such an interesting, scandalizing and maybe incredible story of a Saint. The Synaxarion begins the story placing it during the righteous Emperors Arcadius of the East (395-408) And Honorius of the West (395-423), in the house of a rich nobleman called Euphemianus, who had 3000 servants, but was unhappy because his wife Aglaida couldn’t have any children. Even being righteous and merciful to the poor, pilgrims, strangers and sick, he remained a long time without children, but after some times of prayer, God gave them a miraculous child. He proved to learn very early all the teaching of his time, but being still very young, he had a hidden ascetic life: he worn under his clothes a rough coat. Being at the age of marriage, he was somehow “married” by his parents with a young noble girl. 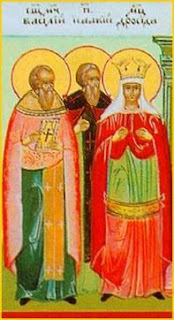 The synaxarion omits to say something about his willing to be married; maybe in that time it was a custom not to marry by love, such as is usually today. After the marriage in the Church of St. Bonifatius (important, because in this very church he will be buried) and the usual ceremonies, Alexius and his wife were alone in the nuptial room. Alexius gave to his wife his golden ring and the belt he had, and told her: “Keep them and may God be with us until his gift will make something new”. Then he left the house, took a boat and left Rome to Eastern Province, establishing himself in Edessa. Here he spent all his money and started a life as a vagabond on the streets, finally being himself a beggar at the entrance of the churches in the city. In the meantime, his father sent many servants to find him and some of them came even in Edessa, but they didn’t recognize him. Instead, they gave him alms such as to a regular poor. His mother and his wife started to wear black clothes and to mourn his unexpected leaving. Alexius stayed near the Church of the Virgin in Edessa about 17 years, and after that the protopresbyter of the church had a vision, in which God discovered his saint, calling him “Man of God”. Being praised for his holy life, Alexius left in the night the town, with the intention to go in Cillicia, in the town of St. Paul. But there was a storm on the sea, and the ship arrived in Rome (which is too far away for any credibility). Being in this situation, Alexius saw his trip as a sign from God and decided to go into the very house of his father. Nobody recognized him, neither the father, nor the mother or even one of the servants, but he became a hut near the house of them and they gave him every day food such as to a usual beggar. During the nights Alexius was always in prayer and many days took nothing from the food sent to him by his father. Instead, the servants mocked him, sometimes he was beaten, or even they thrown on him the rests of the food, but he beard everything without any protest. Every Sunday he went to the Church, took the Holy Communion, and gave further to the poor the food he used to receive. Maybe sadistically to our times, he lived even near the window of his wife and watched her how he was still mourning for him, but he didn’t say nothing, only that the love for God is bigger than the love for the mother, wife or father. After another 17 years he took a piece of paper and wrote his life, and with this in his hands he died, knowing before that his end will come. In the letter he noted some small secrets known only by his father, mother or wife, in order to be recognized that he is the very Alexius, their son and husband. Finally, he begged them for forgiving, but he thought that he made the good thing, because his choice was a calling from God. In that day the Pope Innocent was celebrating the Holy Mass at the Church of the Apostles and had a vision, in which God asked him to search the saint “man of God”: in the house of Euphemianus. The pope together with the Emperor himself and the Court went to the house of the nobleman and finally they found Alexius dead in his hut, having tight into his hand the letter. Only after a prayer they could have taken the letter and read it in front of the people. The shocking news that he was the very son of Euphemianus was very terrible for both his father and his mother, but also for his wife. All of them didn’t know if they must be happy for his holiness or sad, maybe nervous because such of a behavior. The story ends so that the saint is carried on a bed by the very Emperor and Pope, who couldn’t go because of the big crowd. Even throwing them money, the people didn’t want to make place to the cortege. In the end, after many stories about miraculous healings, the Saint was buried in the Church of St. Boniface. 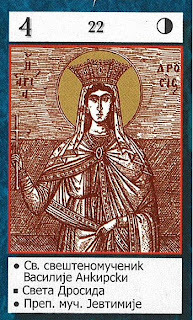 The synaxarion notes that Alexius died on 17th March of the 5919th year after the Creation, that is 411 A.D. There are some special remarks about such a strange saint. First of all, there must be said that this kind of behavior is specially a eastern Syrian type. The first “classical” fool for Christ’s sake is St. Symeon from Emessa, his life being recorded by Leontius, bishop of Neapolis (Cyprus) at the beginning of the 7th century. But even before, the ascetical writings note some special cases of saints who ran from the honor of the men, such as the sister Isidora who pretended to be fool and who was mocked by the other nuns. Being discovered to be saint, she left in the night and nobody found her ever after, as Palladius wrote in his Historia Lausiaca. Some other saints such as Ammonas from Sketis (Egypt, 4th century) laughed continuously until his visitors left him, in order not to be bothered anymore (Apophthegmata Patrum, Ammonas 9). In this context, a life such the one of Alexius is not completely new. The new researches about Alexius the Man of God state that the saint was first venerated in the East and only later in Rome. The Latin versions of his life are relatively late and no real historical proof associate him with the Pope Innocent I or Emperor Honorius. A quite similar story, written in the same Syrian environment, speak about a saint calling him the "Man of God" from Edessa, without indicating his real name. It relates that he lived in Edessa during the episcopate of Bishop Rabula (412-435) as a poor beggar, and solicited alms at the church door. These he gave further to the rest of the poor, after reserving barely enough for the absolute necessities of life. He died in the hospital and was buried in the common grave of the poor. Before his death, however, he revealed to one of the church servants that he was the only son of distinguished Roman parents. After the Saint's death, the servant told this to the Bishop. Thereupon the grave was opened, but only his pauper's rags were now found therein. The inexistence of his relics is almost a common rule for the saints fools for Christ, such as Symeon of Emesa (6th century), Andrew of Constantinople (10th century) or even the mysterious Isidora, whose life is finally remained unknown. The legend about Alexius appears about in the same manner in a hymn (canon) of the Greek hymnographer Josephus (d. 883). There is possible the Greek author of the later biography known the events related in the life of St. John Calybata, a young Roman patrician, concerning whom a similar story is told. Anyway the West Christianity gives no early information about the name Alexius in any martyrologium before the end of the 10th century. He first appears in connection with St. Boniface as the protector saint of a church on the Aventine Hill at Rome. On the site occupied today by the church of Sant' Alessio there was at one time a “diakonia”, a monastical establishment for the care of the poor of the Roman Church. There is almost sure that in this context, the cult of St. Alexius was brought in Rome by an exiled Greek metropolitan, Sergius of Damascus, who came here in 972, at the invitation of Pope Benedict VII, and transformed the Church of St. Boniface into an establishment for the poor. At the beginning of the 11th century Alexius became a very popular saint in Rome and there are a lot of frescoes with him in the churches of the whole West. Today it is believed that the church of Alexius was elevated in the place of the Euphemianus’ house, even the supposed rests of the stairs where Alexius used to sit, are visible today. The most popular Roman version of his life appears, as I have already told, in Legenda Aurea (composed about 1260 AD). There is also to be mentioned that the tale of St Alexius has some visible parallels with the Parable of The Prodigal Son, from the Luke’s Gospel, but interestingly, it is almost identical with a tale supposed to be told by Buddha himself, in 4th Chapter of the Lotus Sutra. 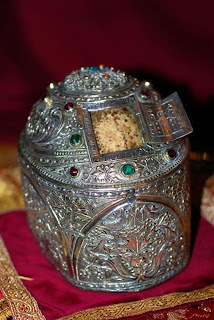 According to a Russian extended version of the saint’s life, the relics were uncovered until the year 1216, being kept in the Church of St. Boniface. Later, some parts of his relics, containing the skull of St. Alexius are to be mentioned that they were given by the Byzantine emperor Emanuel Paleologos in 1398 to the Great Lavra monastery in Mount Athos. 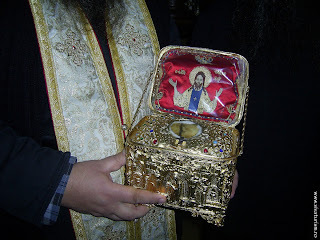 A big pilgrimage in honor of him happened in 2005, when the reliquary left Greece for the first time and travelled to Moscow, being placed at the Novospasskiy monastery for public veneration. The feast of St. Alexius is observed on the 17th of July, in the West. In the Roman Catholic Church he is still recognized as a saint, but his feast was removed from the Calendar of Saints in 1969, and the reason given for that was the legendary character of the written life of the saint. The Catholic Encyclopedia regards also his story as more legendary than real. In the Eastern Orthodox Church St Alexius is venerated on 17 March and his cult is very popular until today, especially in the Slavic countries. Among the many bearers of his name are 5 Byzantine Emperors, 4 Emperors of Trebizond and a Russian one, and also many monks, laymen, bishops or patriarchs. There are also churches built in his names and special services as the Akathist (similar to the catholic Rosarium) was composed to honor his name. 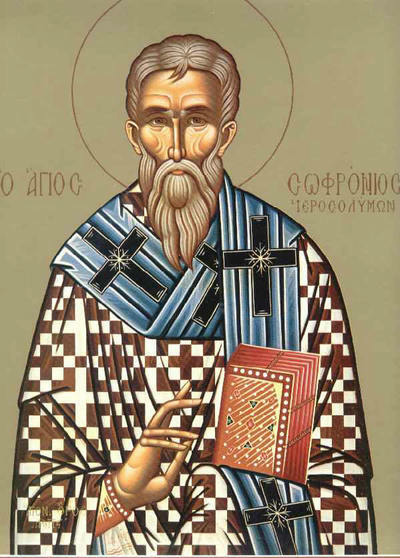 St. Sophronius (550-638) was patriarch of Jerusalem between 634-638 and a great theologian of the Church, fighting against the Monothelites. During his patriarchate, the Arabs took over the city of Jerusalem, but grace to the saint, the Christians won a relative freedom for worship at the Holy Places. Saint Sophronius was born in Damascus in 550 (or 560), having an Arabic ancestry. His pious parents were Plinthas and Mira. As a young boy he was very attracted to learning, so that before being a monk, he taught rhetoric. That’s why he was also called the "Scholasticus" or “the sophist”. He entered as monk in the monastery of St. Theodosius, near Jerusalem. After a while, he left to Alexandria, where he met St. John Moshu, who is the author of the ascetic writing “ Leimon ho leimonon” or the “Leimonarion" (“ The spiritual Meadow” or “The garden of the lemon trees”), considered to be the following history of the Egyptian Patericon (Apophthegmata Patrum). Shortly Sophronius and became his disciple and together they peregrinated through Syria, Palestine, Egypt and Rome. After his mentor's death in Rome, Sophronius returned to Jerusalem, bringing with him the body of John Moshu, which he buried in the cemetery of Saint Theodosius monastery. 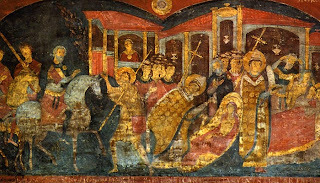 Along with Saint Maximus the Confessor, Sophronius began to fight the Monothelites, and he is the first to notice the danger of the teaching politically commanded by the byzantine emperor Heraclius I (610-641), in order to force the reunification between the miaphysite (coptic, oriental) Church with the Church from Constantinople, and together with it to strengthen the eastern borders of the empire. In 633, while Sophronius was still in Egypt, he had a dispute with the Monothelite patriarch Cyrus of Alexandria, and then also with Sergius, the patriarch of Constantinople, which he failed to convince for the righteousness of his faith. Sophronius was elected patriarch of Jerusalem shortly after 634. In the speech in front of the Election Council, he strongly rejected the monotheletic teaching, and this speech was later sent as an encyclical letter to the Pope Honorius and to all the other Patriarchs, enclosing numerous quotations from patristic sources, supporting the existence of two works in Christ. Patriarch Sophronius participated actively in the fight for the defense of Jerusalem, but he is the one who was forced to mediate with the Arab conquerors the surrender of the Holy Town, taken by Omar, in 637. There is said that, being in front of the door of the Church of the Holy Sepulcher, he invited Omar to enter, but the Caliph refused, saying that if he does this, his followers will later claim rights to the church. Things happened exactly so: later all the churches where Omar entered were transformed into mosques, but not the Calvary Church, which remained until today a Christian sanctuary. 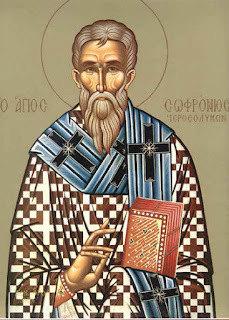 St. Sophronius succeeded in obtaining various civil and religious rights for Christians, in exchange of an annual tribute. One year after this sad event, on March 11, 638 he passed away. The work of Sophronius includes dogmatic, pastoral and hagiographic topics, but also hymnography. Even if is not a very rich work, it reveals a good theologian and a fine thinker, whose insight and doctrinal accuracy underlie the doctrinal formula promulgated by the Sixth Ecumenical Council in Constantinople (680-681). -The dogmatic letter from his enthronement, which focuses on the Christological teaching. After presenting the teaching about the Holy Trinity and the Incarnation, he addresses the fundamental principles of the Christology: in Christ there is a hypostasis or person and two natures or essences. Committing work is done by distinct principles because natures have preserved intact their working powers. In Christ There is always two papers, two energies. He doesn’t talk about the two wills, but because talking about the two works, that is default. - The patristic dogmatic Florilegium in two books, including 600 testimonies of the early Fathers and ecclesiastical writers, proving the existence of two works in Christ. - The life of St. Mary of Egypt (there are opinions that this work does not belong to him). - About 950 troparia and stikheras (groups of hymns) from Pascha to the Ascension. St. Sophronius is celebrated both in the East and West on March 11, and together with him is celebrated also his spiritual father and friend, st. John Moshu. 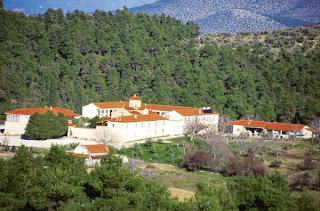 In the early twentieth century some of his relics (his skull) were brought to the monastery of the Virgin “Panagia Faneromeni Hiliomodiou”, near Corinth, in Greece.